Nimble recommends your next opportunity to connect with a potential prospect using relevant keywords you plug into our intelligence engine. You’ll only see the highlighted contacts you want to see based on the parameters you’ve set, such as title, location, company or interests. 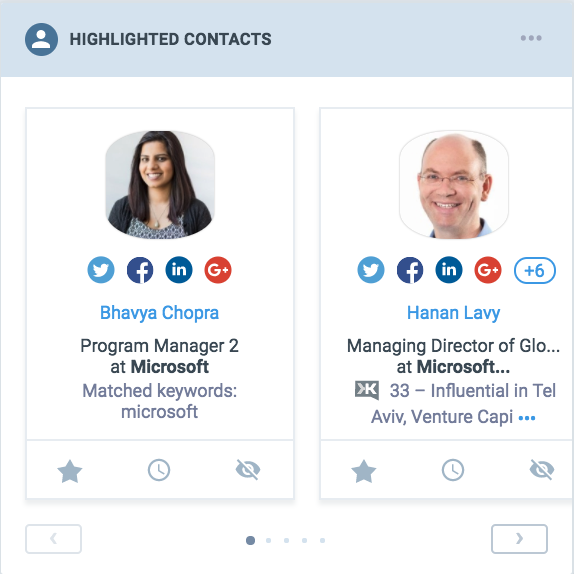 To personalize suggestions for Highlighted Contacts, you can edit the search criteria within “Highlighted Contacts” in your Nimble Settings. Nimble will search these keywords in the social and contact bio for your contacts to surface relevant people for you to connect with. Enter relevant keywords, (i.e. job titles, industries, locations, company name) to help Nimble improve suggestions for your Highlighted Contacts. Separate keywords by commas.